Christ for the World Chapel began ministry at the John F. Kennedy International Airport in 1964 as the JFK Protestant Chapel. The ministry was established by the Council of Churches of the City of New York (then, The Protestant Council). Housed in a stunning A-frame structure designed by renowned architect Edgar Tafel, a protégé of Frank Lloyd Wright, the Chapel was set between Our Lady of the Skies Roman Catholic Chapel and the International Synagogue at the JFK Tri-Faith Plaza. While the three chapels together in the Plaza provided a picturesque setting for weddings and a convenient location for community and church meetings, the location was not particularly convenient for passengers or employees who were faced with a daunting journey on foot across two interstate highways. 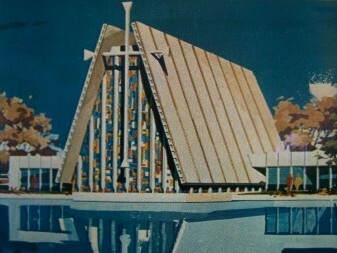 The Port Authority of New York and New Jersey proposed including the chapels in the JFK 2000 project as it was first proposed in the early 1980s. The last service in the old chapel was held January 1, 1988, closing with a congregational procession carrying liturgical artifacts to the new interim Interfaith Chapel located in the International Arrivals Building. Not only was the interim chapel more accessible to employees and passengers, but the arrangement provided the opportunity for closer collaboration among the three chaplains, leading to a stronger interfaith religious presence in the Airport community. In May 2001, the new Terminal 4 opened, replacing the International Arrivals Building. Today, four chapels stand side by side in testimony of our mutual commitment to an interfaith religious presence and cooperation at America’s Gateway to the World.